The programs and activities sponsored through G&EE serve students at all levels of study in the GW School of Business: undergraduate, graduate and Ph.D. The GW School of Business Global & Experiential Education (G&EE) program supports four primary areas: international student services, overseas study, experiential education programs (domestic and international), and advocacy and collaboration related to global and experiential initiatives. Want to see your G&EE experiences on our Instagram? View our one-page Student Guide to Digital Storytelling. Throughout the 10 years of the program, Global MBA students have travelled to 17 countries across six continents, worked on projects in over 35 industries, and consulted for over 110 client partners. The teams will work with clients in Germany, Hong Kong and South Africa this semester, and the program will culminate with a two-week overseas engagement in May. 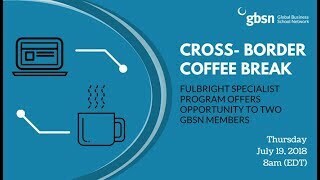 G&EE Director Bryan Andriano recently represented GWSB on a Cross-Border Coffee Break webinar in which he discussed his recent Fulbright work developing a new Master’s program in Innovation & Management at the University of Phnom Penh in Cambodia. Explore the global impact the Consulting Abroad Program at the GW School of Business has made over the past decade. View a slideshow from the Consulting Abroad Program (CAP) 10-year anniversary celebration. G&EE publishes a number of blog series covering buisness and society, our Consulting Abroad program, and our short- and long-term study abroad programs. Explore recent articles below, or visit the blog to view each series in its entirety. Int'l Student Workshop: Thriving In the U.S.
“My name is Dr. Holly Emert — but since we're in the U.S., what do you think I’ll say you can call me?” This was just one of the many questions that Dr. Emert posed to a group of GWSB international students during an interactive workshop on April 4 called Thriving in the U.S. - Skills to Work Effectively with Americans. The goal of the workshop was to provide an opportunity for GWSB’s international graduate students to reflect upon their own personal experiences in the U.S. and explore how to optimize their interactions at work and school. During introductions, participating students from China, Iran, and Portugal shared that they attended the session because they hoped that it would help them navigate future interactions with Americans in professional settings, specifically in school, upcoming internships and jobs. Over the course of the two-hour session, Dr. Emert incorporated engaging activities and honest discussion to help the students identify and understand the best communication practices to build trust and credibility with Americans. The participants reflected on their own experiences in dealing with American communication practices ranging from introductions and expectations to acknowledging mistakes and discussing accomplishments. Takeaways from the workshop were skills for the students to include in their “cultural toolbox” as well as a guide to developing an action plan for professional success. GWSB exchange students recently ventured off campus with the G&EE team on a brisk March day to explore the Library of Congress and the Supreme Court. We kicked the day off with a tour of the Library of Congress — the home of more than 34 million books! We also learned that anyone in the world with an ID and an address can get a library card to access the amazing onsite study room. Some of our exchange students will definitely be taking advantage of the great study space! The original Gutenberg bible was a hit, as well as Thomas Jefferson’s collection of books that he donated to Congress after the capital burned in the 1800s. After the Library visit, we headed to the Supreme Court. Approaching from the outside, it’s easy to feel the power housed in the building — it’s an imposing structure. Inside the courtroom, we noticed a few international law figures carved into the frieze. The Chinese students in the group were excited to see Confucius among them! Overall it was a great day spent exploring some iconic sites around D.C. and learning more about American history and tradition.